“Carlo Zecchi received his first piano lessons from his mother who was herself a pianist. He then had lessons from Francesco Bajardi, a professor at the Accademia di Santa Cecilia in Rome. Zecchi also studied composition with Alessandro Bustini, Licinio Refice and Giacomo Setaccioli. W. S. Cramp, an American from Philadelphia who lived in Rome, assisted Zecchi financially, enabling him to travel to Berlin where he studied with Ferruccio Busoni for a short period. After the death of Busoni, Zecchi decided to go to Paris, but his début in that city was given at the same time as that of Vladimir Horowitz by whom he was overshadowed. It was an introduction to Artur Schnabel that led to Zecchi’s return to Berlin to study with the most important teacher of his career. With Schnabel, Zecchi studied Schubert, many of the Beethoven piano sonatas, and many of the major works of Schumann. During the late 1920s and early 1930s Zecchi had great success in Russia, playing in Kiev, Moscow and Leningrad, and becoming so popular that Stalin demanded to meet him. His greatest success as a pianist came in the years between the two World Wars. He then played in South America and toured North America under the management of Columbia Artists, promoting the pianos of Bechstein. He first played in New York in January 1931, giving his public début in New York the following month. In Philadelphia Zecchi played the Brahms d minor Concerto with Leopold Stokowski and the Philadelphia Orchestra; he also worked with George Szell and Erich Kleiber. When playing in Riga Zecchi met pianist Velta Vait, whom he married in 1936 at Lake Como; his best man was Artur Schnabel, who had left Germany due to the rise of Nazi power. He studied conducting with Hans Münch and Antonio Guarnieri, giving his first performance as conductor in Basle in 1942. Zecchi pursued this other career over the ensuing years, from 1947 appearing as a guest conductor with the Concertgebouw Orchestra, Vienna Philharmonic Orchestra and Leningrad Philharmonic Orchestra. In 1947 he conducted the London Philharmonic Orchestra at Royal Albert Hall when pianist Moura Lympany gave a performance of Beethoven’s Piano Concerto in G major, and in the same year he conducted the same orchestra in the same work for Decca, when it was recorded with Clara Haskil as soloist. For the rest of his career Zecchi chose to conduct rather than play, and performed throughout the world in places such as New York, Buenos Aires, Tokyo and Sydney. He also taught at the Accademia di Santa Cecilia in Rome and gave summer master-classes in Salzburg from 1948. As late as 1981 Zecchi was travelling to Japan for the seventh time to give master-classes there. Zecchi’s keyboard style was refined, poised and very graceful, somewhat akin to that of Arturo Benedetti Michelangeli, yet with more warmth. He had a great clarity of articulation which suited both Scarlatti sonatas and Liszt études. He made his first recordings for Odéon in Paris around 1927. While in Moscow in 1928 he recorded for the Russian label Muz Trust, the precursor of Melodiya, and from these sessions come excellent accounts of Liszt’s ‘La Leggierezza’ and some Chopin études. In 1935 Zecchi was again recording in Paris, this time for Ultraphone. From these sessions come excellent accounts of Chopin’s Grande Polonaise in E flat major and the Étude in F major, Op. 10, #8, plus Ravel’s ‘Alborada del gracioso’. 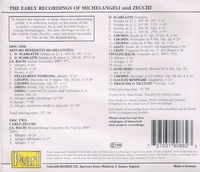 Zecchi recorded two Liszt études that he would record again for Cetra a few years later, and there are also four scintillating Scarlatti sonatas, three of which he again recorded for Cetra. "Arturo Benedetti Michelangeli obtained his soloist's diploma at the age of fourteen, and immediately launched his concert career. His extraordinary talent was recognized immediately and was first honoured in 1939 when Michelangeli won the first prize of the prestigious Geneva International Competition, whose jury was headed by Ignaz Paderewski. His importance as a towering figure among 20th-century pianists was stamped (coined...) by Cortot's saying: 'Here is a new Liszt'."